What makes a sentence strong? 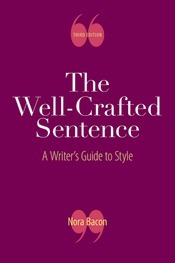 Nora Bacon’s The Well-Crafted Sentence: A Writer’s Guide to Style demystifies grammatical concepts and stylistic choices by taking apart expert writers’ sentences as illustrations and asking students to practice crafting and revising their own. Examples throughout the text are excerpted from 11 readings collected in an anthology at the end of the book, so you can teach style in the context of a larger argument or narrative. With four new model texts, expanded explanations of grammatical concepts, and new coverage of figures of speech, the third edition invites students to experiment with sentence structures that make writing stronger.